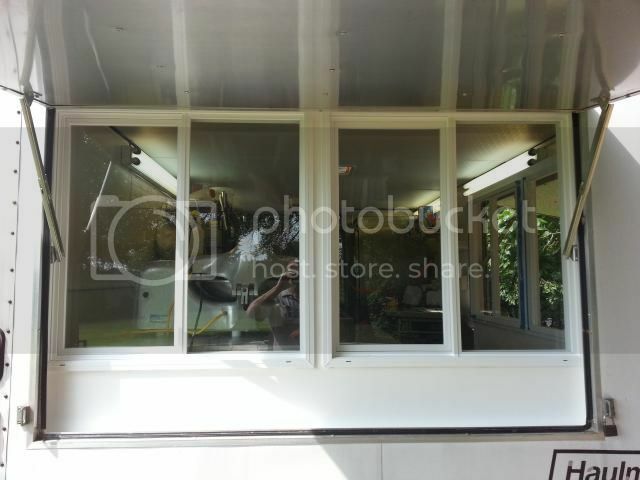 Posted: Tue Jul 22 14 6:27 pm Post subject: Trailer Windows Done ! Hi all finally got the trailer windows done. I think they turned out great. they look great, very professional looking!! Care to share how you went about doing it? I really like the cover / awning for them! The cover or awning is the original window opening that was already cut out by the trailer manufacturer. I can post a before and after picture if you like. I just made a frame large enough to accommodate both the windows and screwed it all together and screwed them to the inside of the trailer walls. I took 2x4's and cut them down to 2 1/8" to allow for the hinges on the outer window opening. I used sliders from menards similar to Pkerchef. Not too difficult PaleAle. Start on the inside of the truck, take off paneling on the inside where you want the window to be. Once you do that then you can get a look at the structure or bracing involved and then you can decide on window size and additional bracing you'll need to add to make it work. Second page 3/4th the way down.